Atkinsons Milling Company background sheet. Except for a few upgrades and a disastrous fire, Atkinson’s Mill has been in continuous operation since 1757. 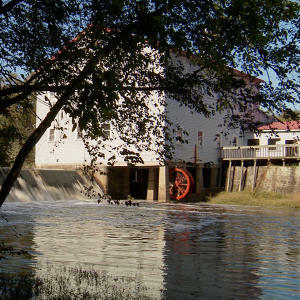 Located on the picturesque banks of the Little River, Atkinson’s Mill and its original earthen dam were built by John Ritchardson when North Carolina was still a colony. The mill didn’t take up much of the 2,400-acre Ritchardson plantation, but provided a generous supply of ground corn to the plantation as well as to area farmers, who bagged their shelled corn and hauled it to the mill for processing. While neighboring farmers would receive a good supply of the basic ingredient for corn bread or “pone”, they also used a trip to the mill as an excuse to give them a chance to fish in the mill pond. Corn grew tall and far in the rich Carolina soil, and became a valuable commodity across the state. The mill’s importance to the community grew as well. In addition to the grist mill, the property ultimately expanded to consist of a cotton gin, sawmill, blacksmith shop, and wheat mill. The mill changed hands several times over the next 100 years, but remained in the hands of descendants of John Ritchardson for the better part of two centuries. Just before the Civil War, Ludsford Richardson was owner of the property when he drowned in the mill pond. His daughter, who married a nearby farmer Thomas H. Atkinson, inherited the mill. Her in-laws were forced to move to the Richardson plantation after Union forces destroyed their farm during the Civil War. When Thomas Richardson died, Thomas Jr. inherited the property. At the onset of the Twentieth Century, the earthen dam was rebuilt and two water turbines were installed. Still in use today, these turbines use an electrical motor for backup when the water level drops. In the 1930s, the earthen dam was replaced with one made of concrete. Owned by Dr. Wade Atkinson, grandson of Ludsford Richardson, died in 1942, and left the mill to his wife Mary Atkinson. She still owned the mill when a fire destroyed the original structure in 1950. Though the turbines survived, the original stones and millhouse were lost in the fire. But that wasn’t the end of Atkinson’s Mill. Three of her nieces Cora, Ruth and Jean McLean desired to keep the mill in operation and in the hands of the family. The mill is still in existence because of their diligence. In 1952, a new millhouse was constructed, and is still in use today. The mill operates with two sets of grind stones powered by the water turbines dating back to 1906, and two sets of stones powered by electric motors. When the McLean sisters retired in 1971, they transferred the corporation’s stock to long-time employees Betty and Ray Wheeler. For the first time in 214 years, Atkinson’s Mill was not owned by a family member. Employees since 1958, the Wheelers had long dreamed of operating the mill, and later bought franchises from other NC milling companies. These additional brand names added to the expanding product line the mill offered. Today, products made at the mill include a line of frozen corn sticks, hush puppies, and pastry strips, which are sold to seafood and barbecue restaurants up and down the East Coast. Farmers now load their corn for processing onto trucks instead of strapping it to the backs of their mules. But one thing that hasn’t changed since 1757, is the sound of the wheels turning at Atkinson’s Mill.